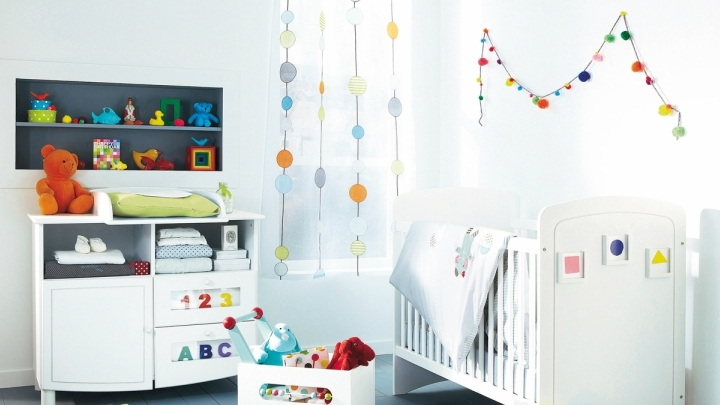 If you are preparing the arrival of a newborn at home and still do not know exactly what elements enter in your bedroom today, we show 7 Ideas to decorate the walls of the nursery. You will discover different ways to give life to this place, whether betting on a painting of some color, wallpaper or other elements that we will tell you next. This is the simplest, let’s say, and the basic idea of any room. But once here you have many alternatives. You can leave them white, a serene and relaxing color for our baby, or also paint one of the walls in some color (the cakes are very good for example) and the rest in white, or all of a soft color, or maybe gamble for some design more colorful as, for example, stripes. You can make them more “classic” or more fun on the diagonal. If you have left your white wall and want to add a note of color you can hang pictures or films that give a fun air to stay. You can put them in boxes light wood, for example, or stuck with washi tape, or as you like. This you can do even if the wall is not white, but maybe not on walls too stamped as it is still a bit overloaded. To the right they are on a stamped wall and they are very well because the drawing is small. If the smooth walls seem a little boring the wallpaper is the best solution. You will get a special touch to the room and there are plenty of reasons to choose. In the baby’s room are great tiny drawings in neutral colors or pastels, for example. So a small size does not overwhelm so much and provide joy to the bedroom. You can play with colored papers or bet on the always black and white cash. If you want to give a special touch without saturating, place the paper on one of the walls, leaving the rest painted. 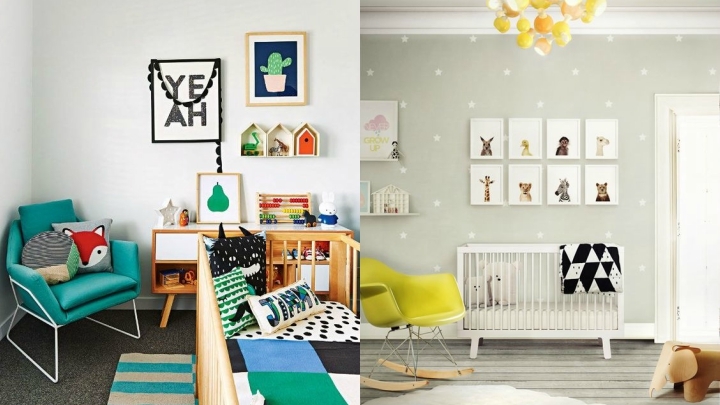 If you put wallpaper in the baby’s room gives you a bit of laziness or you do not have it clear an alternative for the walls to look with some pattern is to place vinyls. You can use geometric, simple forms, and make a composition, or choose larger drawings that fill a wall and fun for the little ones. They are easier to place than wallpaper and you have plenty of options to choose from. Surely the arrival of the baby has illuminated everything in your house. It is the star that guides you now, so nothing better than precisely this drawing to decorate the walls of your room. You have several options: you can put a wallpaper pattern, a decorative vinyl sheets or even a bright star presiding over the wall. The animal heads are decorative trend and look great in any room. Even in your baby’s room. Yes, as you hear. You can place them of different materials like cardboard, rag or paper, and even if you are a little crafty you can make them yourself. We remind a recent DIY where you will find the way to do it. You just have to adapt it to a more childlike theme so that it integrates well with the rest of the decoration. Those of stuffed look great in this room. 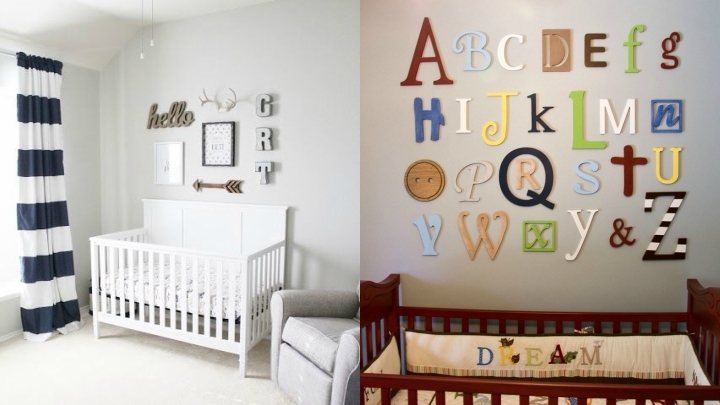 The last idea I teach you is to use the letters of the alphabet to decorate the baby’s room. You can put several of them of colors, form some word or hang a sign or letters that compose the name of the newborn.